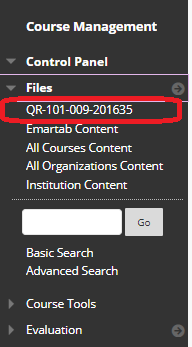 This document provides an overview of Blackboard's Course Content Collection, a storage space for your course files. Scroll to toward the bottom of the left-hand menu into the instructor-only Course Management area. Click the Course ID (e.g. QR-101-009-201635). Your course files will appear in the middle of the screen. Your course content includes any file you have ever uploaded into the course (e.g. a syllabus, PowerPoint file, etc.) - even files that are no longer in use, imported from another course, or duplicated. The date and time the file was uploaded and the size will appear to the right of the file name, providing information about which is the most current.